A robust FMD vaccine stockpile could require an investment of up to $150 million per year for five years. The U.S. has not had a case of foot and mouth disease (FMD) since 1929, but if it were to hit the U.S., the impact would be devastating, with costs estimated at more than $200 billion to pork, beef, poultry, corn, soybean and wheat producers. 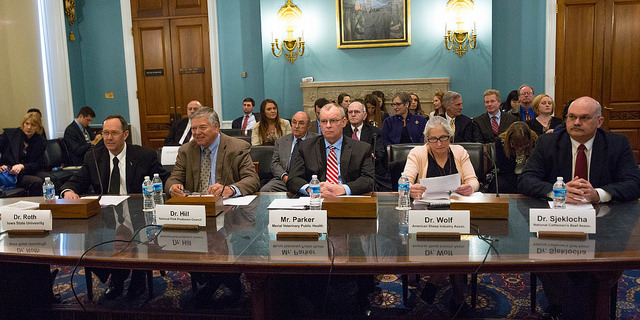 The House Agriculture subcommittee on livestock and foreign agriculture held a hearing Thursday titled "Foot and Mouth Disease: Are We Prepared?" The purpose of the hearing was to outline the cooperation in place between the industry and the agencies in preparation for the possibility of an FMD outbreak in the U.S. and discuss the funding needs if such an event should ever occur. While it rarely infects humans and isn’t a food safety issue, an outbreak in North America, which currently is free of it, could negatively affect meat exports and domestic meat sales. Dr. Howard Hill, former president of the National Pork Producers Council, shared that after watching countries such the U.K., Korea and Japan, whose livestock populations pale in comparison to the U.S., struggle to manage an FMD outbreak by killing large animals, the Animal & Plant Health Inspection Service (APHIS) changed its existing policy on managing the disease from “stamping out” to using vaccine to limit the spread. “The United States simply cannot kill its way out of an FMD outbreak,” Hill testified. Industry supported the vaccine approach as a less costly, more humane and more practical given the U.S. herd size, he added. Currently, the amount of vaccine available at the North American FMD Vaccine Bank is below what would be required for an outbreak. The funding U.S. Department of Agriculture has and is receiving for the National Veterinary Stockpile is insufficient to provide adequate FMD vaccine stockpiles, which would slow the deployment of a vaccination strategy. Several funding options are under consideration and were discussed in the hearing including industry groups helping foot the bill. One mention even indicated possibly using checkoff funds, however, current law would not allow for checkoff funds to be used other than research or promotion. Dr. Jim Roth, director of the Center for Food Security & Public Health at Iowa State University’s College of Veterinary Medicine, noted that the size, structure, efficiency and extensive movement inherent in the U.S. livestock industry will present unprecedented challenges in the event of an FMD outbreak. “It will be nearly impossible to control and FMD outbreak in livestock-dense areas without the rapid use of tens of millions of doses of FMD vaccine,” Roth said. Roth has estimated that a robust FMD vaccine stockpile could require an investment of up to $150 million per year for five years. He noted that the vaccine capability could gradually increase during the five years, initially focusing on the most common strains of FMD virus. Establishing and maintaining an FMD vaccine bank is complex. There are seven distinct serotypes of the virus that are not cross protective as well as approximately 65 subtypes. The World Reference Laboratory for FMD recommends that FMD vaccine banks maintain 23 strains of the FMD virus in the vaccine bank. U.S. law prohibits live FMD virus from being on the U.S. mainland, so APHIS contracts with foreign vaccine production companies to produce finished vaccine from the antigen stored at Plum Island Animal Disease Center, off the coast of Long Island, N.Y. Only a limited number of FMD strains are covered by the antigen stored at Plum Island, and under current production contracts, only 2.5 million doses of vaccine could be produced within three weeks of an outbreak. * Contracting with an offshore, vendor-maintained vaccine antigen bank that would have available antigen concentrate to protect against all 23 of the most common FMD types currently circulating in the world. * Maintaining a vendor-managed inventory of 10 million doses of vaccine, which is the estimated need for the first two weeks of an outbreak. * Contracting with an international manufacturer or manufacturers for the surge capacity to produce at least 40 million doses. Dr. Dave Sjeklocha, veterinarian and the operations manager for animal health and welfare for Cattle Empire LLC, testified on behalf of the National Cattlemen's Beef Assn., saying vaccination of cattle against FMD has been practiced with relatively positive immunity results. Cattle are considered to be the highest priority for emergency FMD vaccine use. For example, in the 2001 FMD outbreak in Uruguay, the outbreak was brought under control by the rapid vaccination of all the cattle in the country. Sjeklocha said the funding that USDA has for the supply of FMD vaccine in the National Veterinary Stockpile is insufficient to provide adequate FMD vaccine supplies. An outbreak of FMD occurring in a livestock-dense area, such as Iowa, and which was not contained rapidly with “stamping out,” could easily exhaust the world’s supply of emergency FMD vaccine. A FMD outbreak in South Korea depleted the banks of FMD vaccines from around the world in order to vaccinate a population roughly half the size of the livestock population in Iowa. “Currently, the beef industry is involved in a collaborative effort with USDA, state animal health officials, and academic partners to develop a 'Secure Beef Supply Plan' to manage movements of non-infected cattle in the event of an FMD outbreak; provide business continuity for producers, transporters and processors; and to maintain a continuous supply of safe and wholesome beef for consumers,” he testified. To deal with any foreign animal disease outbreak, the U.S. pork industry has been working with USDA on a “Secure Pork Supply” plan, which would enhance coordination and communication among producers and federal, state and local government officials, support continuity of operations for producers and accelerate disease response. Part of that response would be vaccinating susceptible animals. Pork producers are further ahead in its ability to trace back animals if needed, whereas the cattle industry especially does not have a strong industry standard for traceability.